RACE and real estate take centre stage as Clybourne Park takes a look at the changes which can occur in a 50-year period – some massive, some subtle. Bruce Norris’ award-winning play tackles the thorny issues head on, kicking off just ahead of the swinging ’60s as a black family move into a white enclave, triggering all too predictable mutterings from their new neighbours. Fast forward 50 years, and the roles are reversed as gentrification comes to the same neighbourhood. “Bruce Norris has written a masterpiece,” says Gloria Ontiri, who plays downtrodden maid Francine in the first act of the play and educated, informed and passionate Lena in the second. “It makes you laugh and feel uncomfortable at the same time; a winning combination in my book!” she adds, explaining that the switch in time periods demonstrates the similarities in the nature of dynamics between different ethnic groups in both times as well as a heart-breaking tale about a couple suffering deep loss. 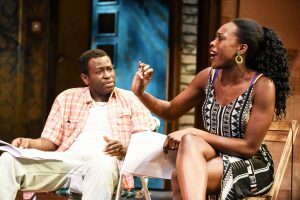 “Race and real estate is an issue that will sadly never go away, so the play is socially relevant and universal. “It’s a taboo conversation to have and reminds us that we are not so different now to those before us 50 years ago. The switch in character for Gloria is just as stark as the change in social attitudes. “Francine is interesting because she’s a maid in 1950s America,” she explains. “As an African-American woman of that time, when black people were still in a position of disempowerment, there are things that she may be thinking but not permitted to say. Gloria will be joined in the cast by Mark Womack, William Troughton, Ben Deery, Dan Gaisford, Rebecca Manley, Rebecca Oldfield, and Wole Sawyerr. Clybourne Park is at the Yvonne Arnaud Theatre, Guildford, from Monday (2 May) until Saturday 7 May.